Available in Metro Manila Desserts Centers only. Share the love all weekends of February (Friday-Sunday, Feb 12-14, Feb 19-21, and Feb 26-28), from 3-6pm. 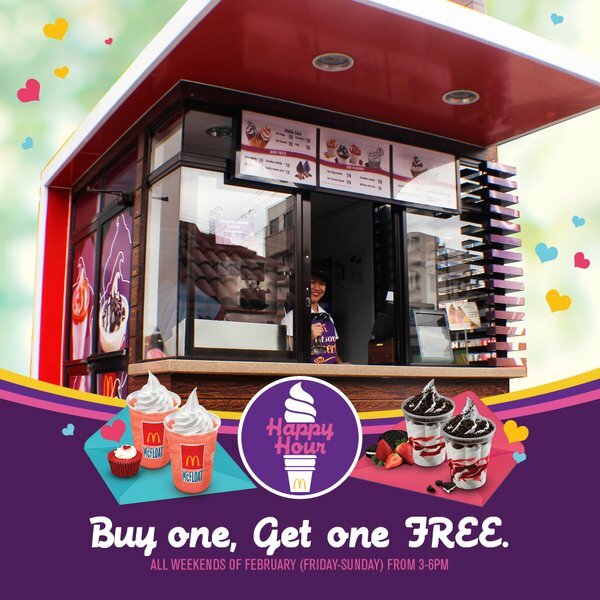 Buy the Strawberry Kiss Oreo Sundae or Red Velvet McFloat and get another one of the same kind for FREE! The Happy Hour promo will only be available at all McDonald's Dessert Centers in Metro Manila. This offer is not available in McDonald's main store, McDelivery, Drive-Thru, and Take-Out Counters.